Finepac is Manufacturer and supplier of Biodiesel Plant in India as well as Overseas also. Biodiesel is an alternative diesel fuel. Biodiesel Plant is produced by chemically reacting a vegetable oil or animal fat with a primary alcohol. The resulting compound is called an alkyl monoester and has properties, that allow it to provide equivalent performance and superior emissions compared to conventional diesel. Biodiesel is renewable, non-toxic, as well as biodegradable. This Biodiesel plant can produce biodiesel using Jatropha, Karanja, Neem or any other vegetable oil (with low FFA) by converting the triglycerides into methyl esters by transesterification Process. Biodiesel refers to a non-petroleum-based diesel fuel consisting of short chain alkyl (methyl or ethyl) esters, made by Transesterification of vegetable oil or animal fat , which can be used (alone, or blended with conventional petrodiesel) in unmodified diesel-engine vehicles. Biodiesel is distinguished from the straight vegetable oil, used (alone, or blended) as fuels in some converted diesel vehicles. "Biodiesel" is standardized as mono-alkyl ester. Biodiesel is a biofuel produced from various feedstock’s including vegetable oils (such as oilseed, rapeseed and soya bean), animal fats or algae. Biodiesel can be blended with diesel for use in diesel engine vehicles. 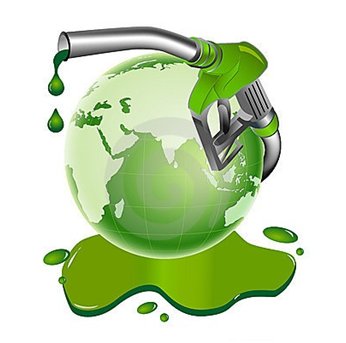 Biofuel – The term biofuel applies to any solid, liquid, or gaseous fuel produced from organic (once-living) matter. The word biofuel covers a wide range of products, some of which are commercially available today, and some of which are still in research and development. Biodiesel is a fuel made from plant oils that can be used in a conventional diesel engine. There are three basic methods for biodiesel production from oils and fats. Almost all biodiesel is produced using base catalysed trans-esterification as it is the most economical process requiring only low temperatures and pressures and produces a 98% conversion yield. 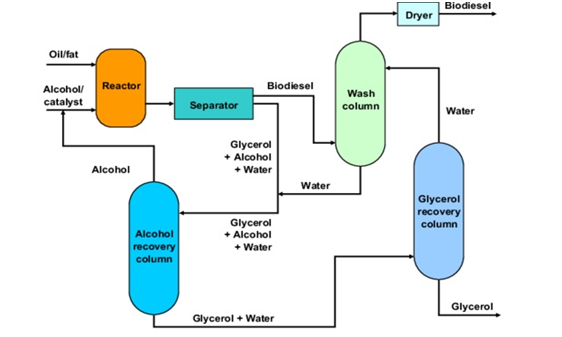 The reaction between fat or oil and the alcohol is a reversible reaction and so the alcohol must be added in excess to ensure the complete conversion.The excess methanol used in the trans-esterification process during biodiesel purification is recovered from the aqueous glycerin phase through distillation and recycling. The column is operated in continues distillation mode. Pressure – In biodiesel plant the methanol recovery Column is operated under vacuum with Finepac Structured Packing& internals for the column. Finepac® Structures Pvt. Ltd. has exported biodiesel production systems for several overseas client along with the associated process design and guarantees. The design involves production of export grade biodiesel as per ASTM 6751-13b.